One hundred and sixty three minutes of riveting viewing. 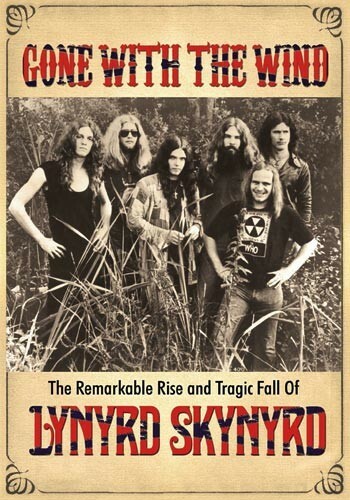 This is possibly the longest, most structured and in-depth look at the roots and formation of Lynyrd Skynyrd through their formative years, through the trailblazing five year roller coaster ride from the release of 'Pronounced 'Léh-nérd 'Skin-nérd' to original Skynyrd's final album 'Street Survivors' before it all came to a shuddering halt on October 20th 1977. 'Gone With The Wind' is one hundred and sixty three minutes of riveting viewing. There have been a number of documentaries on Skynyrd, most of which have always seemed pre-occupied in getting to October 1977 and tending to forget what went before, which was five studio albums and the classic live album 'One More From The Road' which not only established the band name but ingrained them into modern music folklore. This documentary features lots of rare footage from the early days, goofing around, live performance and relaxing. Some of which has been seen before, however most of it not. Charting the getting together of the Noble Five, through the One Percent, and eventually their transformation into LS. At times, it is indeed intricate stuff, much of the tale told by those that were there at the very beginning; Larry Steele, a lifelong friend of Ronnie Van Zant and of course co-writer of a number of .38 Special hits, original drummer Bob Burns (who passed away shortly after filming), Gene Odom – Skynyrd security, manager Alan Walden, producer Al Kooper plus band members Ed King and Artimus Pyle. This documentary gets into the in-depth nitty gritty and reads exactly as a good Rock and Roll, warts and all documentary should. A lot of what's contained is already in the public domain, however King's marginalisation, as brilliantly emphasised by that photo at the hell house where it's six Southerners on one side and the Californian on the other, is expanded upon. As is the bands drinking, Van Zant's legendary temper, their rise to the very top, and the subsequent destruction of not only a band career, but personal lives following the 1977 plane crash that killed six people. There is, of course, in depth discussion, opinions, points of view and witness accounts dealing with that which, despite its macabre subject matter, remains a fascinating subject. While the documentary does not expand much beyond the end of the original line-up, it does touch on the reunion tour of 1987. There is much here already common knowledge, however its perhaps hearing a more in-depth and first-hand explanation of key decisions by key people (Walden, Kooper) right down to King's narrative on the writing of 'Sweet Home Alabama' and all points in between, and Pyle's stellar ongoing defence of the memory of the original band, that makes this is a MUST SEE. Rarely can any documentary warrant such a lengthy running time, but it is riveting viewing and I did not realise the time go by such was the easy flowing nature of it. Lynyrd Skynyrd fans, yet another to add to the list of must have's.